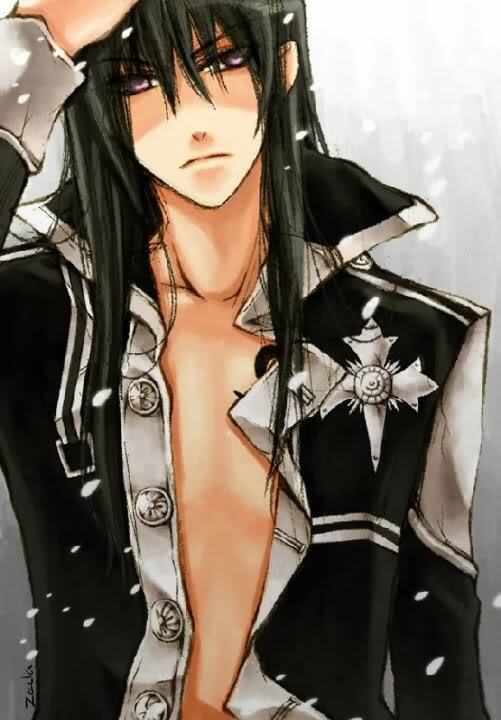 Daemon is a young man with long black silky hair the longest strands being just to the length of his chest. His eyes are slightly unusual being a rose pink color with a glassy red tent. He is about six feet tall slender well chiseled body being that of a kendo practitioner before the days of the Reign. On the left side of his body he has a strange tattoo that of a swallow surrounds by rain he received this tattoo in dedication to Yamamoto Takeshi because he inspired him on his path of the sword. Before the Reign Daemon was a normal high school student days away from graduation. He was slightly over the grades of the average students. He wanted to become a engineer but he father forbidded him from following his dreams. So he turned to anime along with his bestfrined Jaden Silver strange enough he started to transition into kendo. 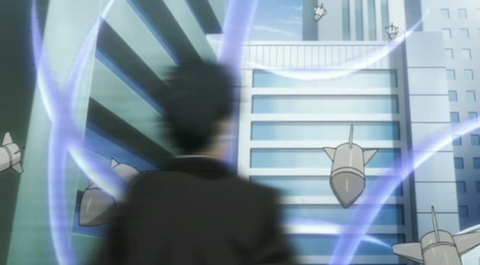 He would stumble upon the anime Katekyo Hitman Reborn. This was him and Jadens favorite anime and they're and friendship only grew stronger watching it together. But suddenly Jaden's parents would commit suicide sending him into stage of depression and loneliness and quickly they're friendship dwindled away. 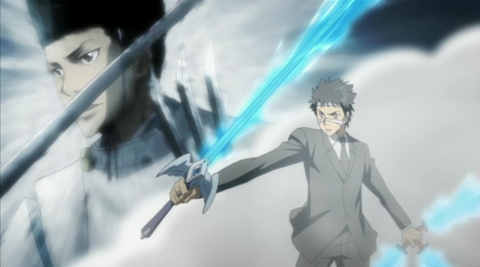 Shortly after that Daemon would move to new york where he continued watching KHR and shortly after take intrest in Yamamoto Takeshi sword style. Daemon would desire to learn kendo and would secrectly train attempting to bring the sword style Shigure Soen Ryu to life. Sadly he wouldn’t be able to preform that task although in remembrance he would get a tattoo to remember thr passion he held for bring that sword style to life. After the Reign Daemon attempted to find the answers of how he possesed theseboowers and why. Strange thing was thay he was not the only one this phenomenon happened to. Many others were gaining the powers of anime characters and no one could explain why. 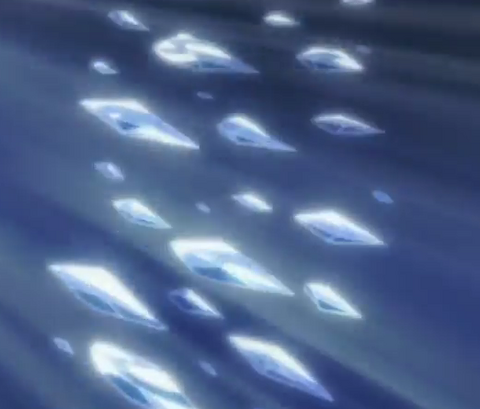 The amount of people with transcended powers only continued to grow and with extreme pace. Daemons close friend Alexzander Xavier Cross obtained powers of his own and went down his own path of investigation. In any case until questions where answered Daemon would train and skillfully learn the moves of his idol to continue to carry on the will of the Shigure Soen Ryu combine with new ambitions of his own. Daemon is a extreme loner. He tends to stay away from people because of his extreme shyness and nervousness. He likes to get to know people from afar before he communicates which leads to him having a good since of judgement. Daemon is incredibly kind and trustworthy and yet he appears to be a bully and ferociously angry. Although he tends to void human contact when he does he may be easy to manipulate or control. Yet when he enters battle hus personality changes drastically he becomes deadly serious and protective over anyone under his jurisdiction. He in additon becomes completely selfless and in a way heroic nervousness and shyness fades and he is now able to work other in complete unison. He is slightly above the normal intelligence of those within his age group. He does what he deems is right, which mean he preference for good or evil isnt clear yet he deems the good side more beneficial. He at times may be stubborn or difficult when his needs arent met. Shigure Kintoki- This blade is Daemons main weapon it appears to be a normal bamboo sword for kendo but when used in unison with Shigure Soen Ryu it enters its true form a invincible steel blade. It allows him to use the Shigure Soen Ryu and only the Shigure Soen Ryu. Using any other technique will result in the blade to return into its bamboo form. Rain Attribute Flames- Daemon has control of the rain flames and their factor "Tranquility." He may use the flames to enchance his Shigure Soen Ryu techniques. The rain attribute flame in addition has a hard and soft form the soft being a water substance hard being ice. Vongola Rain Ring- With his Vongola Ring he is able to produce rain flames of high quality and purity to preform attacks using rain attribute as well as detect invisible objects using rain flame radar. Rain Flame Box Weapon- When opening this box Daemon, rain flames in the form of a spiral water vortex covers a user with rain flame and tge Tranquility factor. -20 speed for opponents for one post, three post cool down. Yarazu no Ame- The third form of Shigure Soen Ryu, it is a offensive form. Daemon drops his blade shortly before making contact with the ground he would kick the hilt of the blade with great force sending it flying forward to stab or pierce its target Cooldown 2. +30 attack. Gofuu Juuu- The fourth form of Shigure Soen Ryu, it is a defensive form. Daemon synchronizes his movements with a users breathing to avoid at a high speed cooldown. +21 sense, 4 post cool down. Utsushi Ame- The ninth form of Shigure Soen Ryu, it is a offensive form. Daemon uses his sword and Rain Flames or water to make a huge tidal wave which reflects his appearance through to the opponent. While his true self is above the opponent attempting to strike them with a heavy slash cooldown 3. +25 attack, +20 Defense. Scronto di Rondine- The tenth form of Shigure Soen Ryu, it is a offensive form. Daemon surrounds his body with rain flames then charges forward with immense speed along with his swallow to strike the opponent with a piercing charge cooldown 4. +35 attack, +20 speed, 10 defense. Beccata di Rondine- The eleventh form of Shigure Soen Ryu, it is a offensive form. Daemon stabs his blade forward several times in one swing. (If this attack is used in unison rain flame if one stab connects it will slow down the opponent making them easier to hit with the other stabs this effects continues to slow down the opponent with each stab. )Cooldown 4. +30 attack +20 speed. Attacco Di Squalo- The user rushes at their opponent with a heavy sword slash under a coat of Rain Flames that sends a massive shock wave through their body paralyzing them for one post. +30 strenght -100% of the speed of the opponent if connected to a solid substance such as a sword, armour, or bone. Cane di Pioggia Ver. 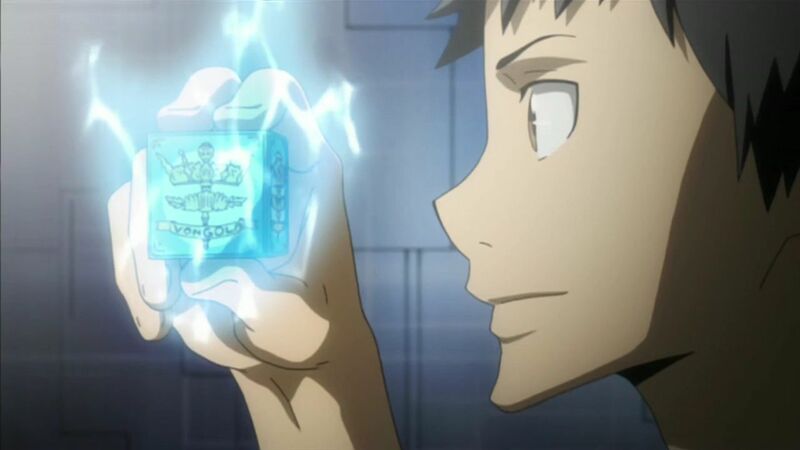 Vongola- Daemon's second box weapon. Also know as Jirou a rain dog type animal box weapon. This box weapon is the keeper of Daemon's three other swords which allows Daemon to use Ugetsu Asari's Four Irregular Swords. Three of the four swords may be used as jet propulsion. (+30 Speed upon movement, can use once a post). Rondine di Pioggia Ver. Vongola- Same as its past form although it now has the ability to fuse with Shigure Kintoki. Ugetsu Asari's Four Irregular Swords- Comprised of Shigure Kintoki, Kojirou and three bladesless sword hilts recieve from Jirou Daemon is able to construct three blades using rain flames to make the three bladeless hilts into Rain Attribute Swords. Next Kojirou and and Shigure Kintoki combine to form a long sword which hilt is shaped as Kojirou's body. 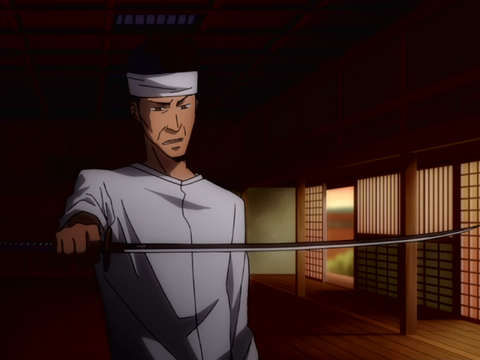 Thus forming one long sword and three short blades which gives Ugetsu Asari's Four Irregular Swords its name. Daemon's short blades made of rain flame allows him to o reform high speed movements in addition he is not about to fly. In addition the flame from his main blade can be used to further extend the lenght of reach of his sword. All of these swords have the ability to used the Rain Attribute Tranquility factor to slow opponents and attacks to a slow level. The Shigure Soen Ryu forms can still be used in this form and there oower are increase. +65 Magic, +65 Strength, + 25 Speed, + 20 Defense, + 20 Magic Defense. Well. Since you have a shite ton of tools, and abilities that boost your stats... I'm going to lower your base number from 130, down to 100. My reasons for doing this are your defensive stats, and the fact that you have so much circumstantial moves. This being said, you also have nerfing abilities. Please, distribute as said and you will have that shiny golden seal of approval.